Is that a fat Llama? forget the seahorse and the tree, is the Llama on the left FAT? — Watching out for FAKE MONEY in Peru. Here´s one of the last sentences I thought would be spoken to me in Peru but really, it could happen to you too. I was on a bus and the conductor was refusing to accept my money. Apparently, a LOT of false coins and notes exists in Peru and tourists, who are not entirely familiar with the currency, are prime targets. I took my coin back, looked at it in comparison with another coin. It didn´t look fake at all. 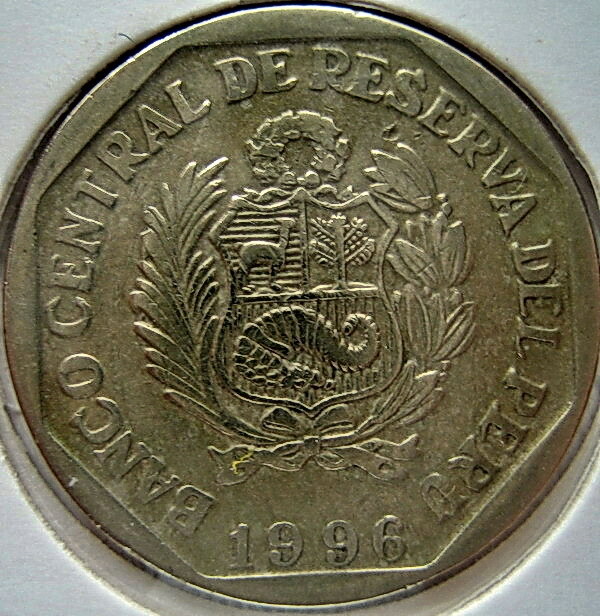 That Llama on the coin looked NORMAL to me, not FAT. Strangely, this drew a lot of attention from the other helpful bus passengers. My FAKE coin was passed around and everyone in the bus generally agreed now that it WAS fake but when I asked them to point out the differences, they couldn´t really say. Many chose to ask a neighbour passenger, or took out one of their own coins to compare. Some claimed the REAL coin looks finer, is better designed, is heavier, has more shine, all of which to me was subjective and not definite. Others point out the Llama, the seahorse and the three emblems on the back of the coin are the best signs. “Look, the seahorse is more beautiful and the Llama is thin, ” one passenger finally said. I really can´t tell. But since that incident, my coins have also been rejected a second time by another bus conductor as FAKE. So, in Peru, everyday, I look and look at all the change that I receive back from vendors. I would even go as far as asking them whether they have handed me some fakes and make them convince me that it is not. THankfully, I have NOT received FAKE NOTES yet, although everyone is also very careful about them here. “But I got this from an ATM machine, from the BANK” I told her. She was not sympathetic to that. Apparently, even banks pass around FAKE notes with or without knowing it. Luckily another restaurant patron backed me up. On Peruvian notes are a series of shiny dots, about 10 or so, that you can tear away each time in doubt. if after tearing the small dots, a blank space remains, then the NOTE is real, apparently. Other telltale signs are same like standard currency with watermarks and black lines running through etc… The restaurant accepted my note after passing the tear-dot test. AFter a few weeks here, I am still figuring out what is the foolproof ways of telling FAKE money. I certainly can´t go around tearing dots on every note I get although I try to stare hard at each Llama emblem. There are no agreed standard, it seems, the FAKES are just that GOOD. But except for big notes, I am learning not to worry too much about that less shiny coin that I may receive now and then. For eventhough it is said to be FAKE by some, I have managed to pass on two such coins to other innocents… goes around, comes around. Oh well.